Back again and better than ever! 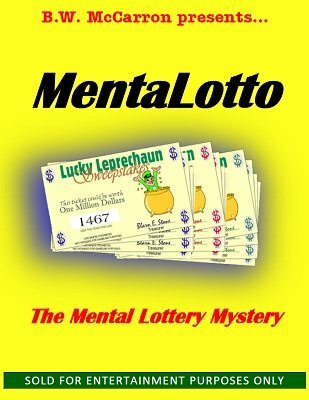 It's MentaLotto , the mental lottery mystery that's sure to please any audience. "A clever idea!" according to noted author, lecturer and trade show performer Karrell Fox. MentaLotto combines mentalism, audience participation and a gambling theme. The odds are a trillion to one against the mentalist making a correct prediction. Yet, that's exactly what happens, for when the prediction is opened and read aloud, it matches the spectator's selected lottery number! No switches, confederates, electronics, one-ahead, glimpses, impressions or other methods are used. Truly a one person effect. Can be performed surrounded. No equivoque. The spectators have a free choice of tickets and, yes, each ticket is indeed different! Supplied in PDF format with complete routine and now with PDF masters to print up your own supply of "Lucky Leprechaun" sweepstakes tickets in color or B&W. No need to purchase the effect again and again in order to obtain refills. A big effect and one that you will use. Great for publicity purposes or to spice up your magic or mentalism act. What more can we say? It's a winner! Sold for entertainment purposes only. 1st edition 1983, 1st digital edition 2015, 58 pages.